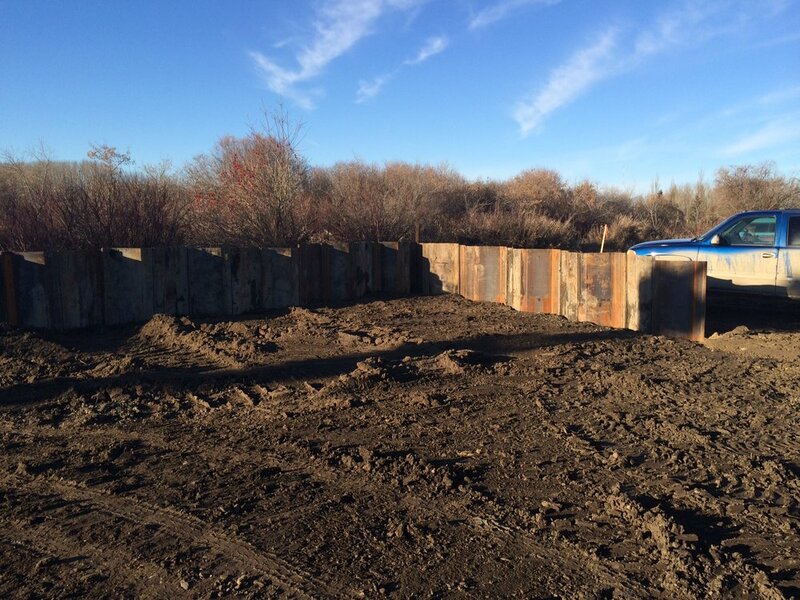 Summit Liability Solutions Inc. completed a remediation project on a wellsite located west of St.
encompassed the site to the east, west, and south. The wellsite consists of a 100/ well and 102/ well which were drilled in 1957 and 1958, respectively. There was crude oil, gas, and water production associated with the site and the 100/ well and 102/ well were abandoned in July 2014 and March 2014, respectively. The surrounding vegetation consists of riparian grasses, willows, wild rose, and poplar. Hydrological and subsurface investigations conducted at the site in 2013 indicated that the water table was shallow and the groundwater direction flow was southwest towards the Sturgeon River. As groundwater impacts were known to be present on-site and the location of the wellsite presented unique challenges for remediation due to the proximity of the river and riparian areas; it was determined that a sheet metal retaining wall would be installed surrounding the known area of impacts during remediation. The purpose of the sheet pile retaining wall was to allow for the containment, collection and disposal of impacted soil and groundwater at the site and to prevent additional groundwater flow into the open excavation.The project commenced on October 15, 2014, 50 foot interlocking metal sheets were transported to the site and cut to the desired length. 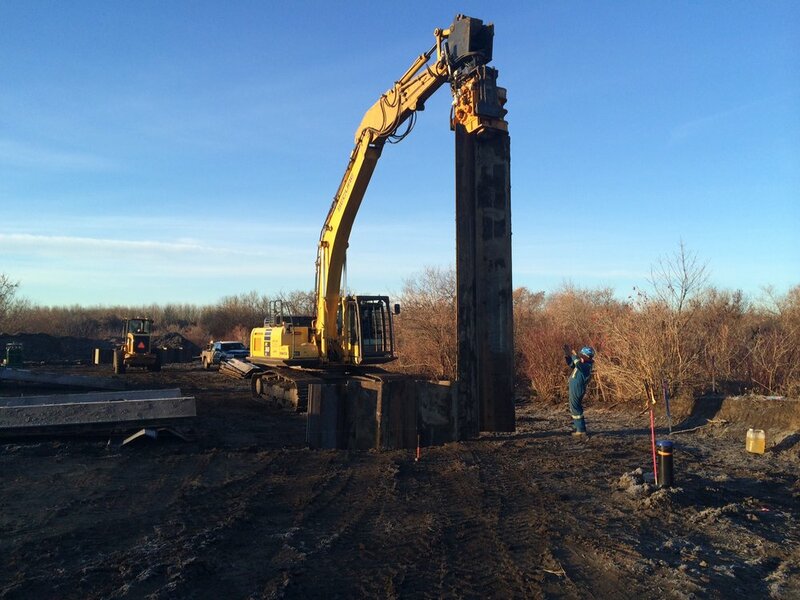 Installation of the retention wall was completed from October 26 to November 7, 2014 using a track hoe with a sheet piler attachment to drive each sheet into the ground to a depth of approximately 7 metres below ground surface (mbgs). 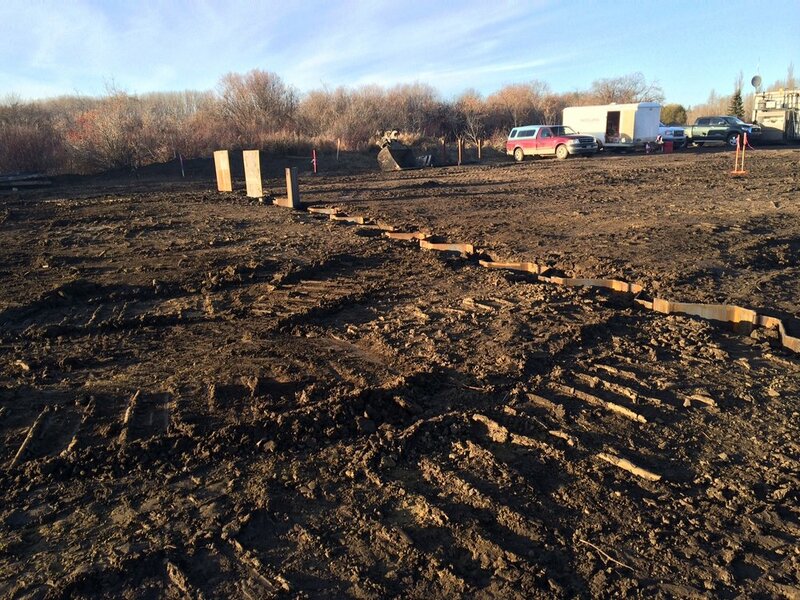 The complete sheet metal retaining wall measured approximately 51 m by 37 m. All soil contained within the retention wall was excavated from December 9, 2014 to January 17, 2015, to a maximum depth of 4.8 mbgs, guided by field screening and progressive confirmatory sampling. During remediation efforts, minimal groundwater recharge occurred simplifying the remediation process. The removal of the retention wall was completed from January 18 until January 25, 2015. The site was then re-contoured and a silt fence was installed along the lease boundaries adjacent to the Sturgeon River to mitigate future soil erosion.